In developing countries, access to adequate medication, nutrition and treatment are severely limited. As HIV/AIDS spread because of lack of knowledge and the lack of agency women have over their bodies, a large population becomes bed ridden, life expectancy falls and the workforce is cut almost in half. According to comparative studies completed by UNAIDS "East African businesses have shown that absenteeism due to HIV/AIDS can account for as much as 25–54% of company costs." The loss of labor significantly decreases the amount of skills that can contribute to economic progress, the man power needed to sustain businesses and productivity that is necessary to compete in the world market. More results from UNAIDS show that in "several southern African countries the combined impact of HIV/AIDS-related absenteeism, productivity declines, health expenditures, and recruitment and training expenses, could cut profits by at least 6–8%. "The grimly results are food shortages due to lessened farming, less industries willing to invest in these developing countries through employment, a rapidly growing trade deficit, reduced business expansion as the development of technology become stalled, a stagnant GDP and the inability to expand the industrial base. 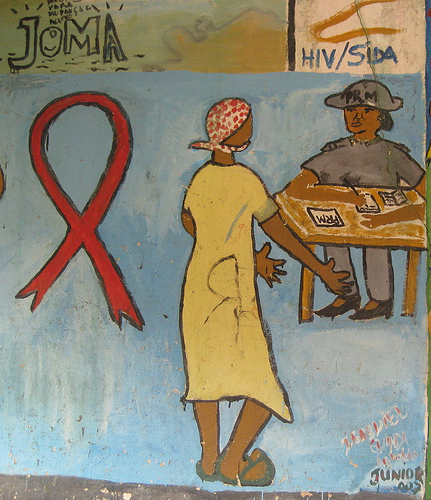 Widespread HIV/AIDS puts a heavy stress on institutions within Africa. The large amount of resources dedicated to fighting the epidemic limits the amount of resources that could be used for advancing the economy through infrastructure, education, and innovation. Overtime as the government economic capacity shrinks, taxes dollars are stretched, budgets for schools are tightened, debt rises faster than the government can handle and welfare programs become unable to support those who need the services. Hospitals are not able to invest the time and capital into research for preventing diseases and finding effective treatments for other ailments such as cancer. Government also suffers monetary losses from the death and costly treatment employees that contract HIV/AIDS. The reduction of employees from HIV/AIDS results in the degraded quality in the delivery of municipal, defense and education services. The U.S. Agency for International Development reports that Zambia Wildlife Authority in 2005 experienced a six percent reduction in service delivery capacity due to HIV/AIDS related death. Many families are already struggling with a lack of resources, education and opportunities. Once a family member contracts HIV/AIDS the effect on the rest of the household is immobilizing. The expense of health care for the inflicted and the costs of a funeral absorb nearly the entire household income. Children that should be attending school are now tending to the parents and nurturing their siblings, parents are dying and leaving behind orphans and funeral expenses while taking much needed income, girls may turn to prostitution which continues to cycle of contracting HIV/AIDS and poverty. According to a report done by Kaiser Family Foundation of 771 families in South Africa “More than 40% of families reported that the primary caregiver had taken time off from formal or informal employment or schooling to take care of the HIV/AIDS-sick person, adding to the loss of household income and the underschooling of girls”.